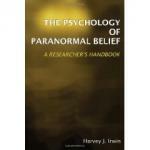 Review by Renaud Evrard of a book on psychology of paranormal belief. Harvey J. Irwin has taught psychology and parapsychology for 25 years at the University of New England (Australia) and has won an international reputation in research on the psychology of paranormal beliefs and parapsychological experiences. He has published in particular An Introduction to Parapsychology (Mc Farland, 1989, five editions) which is now the reference textbook for courses in parapsychology. This definition has the merit of reflecting the important diversity of the beliefs that fall into this category, while excluding idiosyncratic beliefs, demonstrably psychotic delusions and developmentally immature beliefs, and scientific hypotheses awaiting empirical evaluation (p. 17). When renaming “scientifically unaccepted beliefs” (p. 109) these beliefs, Irwin explicitly underlines the relationship between science and belief, noting that the paranormal is its predisposed interface. Thus defined, this subject has been the matter of numerous studies, extensively reviewed by Irwin (the bibliography goes along pages 129 to 176 !). The book presents itself as a researcher’s handbook that facilitates further works on many promising as well as uncertain areas. To do this, the appendices gathered 14 scales of great utility, developed from 1925 to 2001, along with the author and the subject indices. The book’s sections are very logical and rigorous. Are first analyzed some notions on the influence of sociocultural background on paranormal belief (chapter 2, 22-34) and on the psychometrics of paranormal belief (chapter 3, 35-50). While it is clear that diverse sociocultural structures influence the form or type of the paranormal beliefs embraced by a person, most psychologists have rather focused on why a person would be psychologically prone to endorse any given paranormal belief (or disbelief). The author then analyzes the main attempts to explain the genesis and maintenance of these beliefs by grouping them in four hypotheses, each subdivided precisely : the social marginality hypothesis (chapter 4, 51-66), the worldview hypothesis (chapter 5, 67-76), the cognitive deficits hypothesis (chapter 6, 77-90), and the psychodynamic functions hypothesis (chapter 7, 91-106). Systematically, the author shows the empirical strengths and weaknesses of each of these hypotheses. He concludes that empirical data do not validate earlier simplistic characterizations of paranormal believers as socially marginal, subjectively oriented, cognitively deficient, or psychologically dysfunctional (p. 128). Indeed, “if social marginality does have a substantial bearing on the strength of paranormal beliefs, it cannot be the sole factor that needs to be encompassed by a viable theory of paranormal belief. Indeed, the very fact that many paranormal beliefs are embraced by a majority of the population appears to disqualify the social marginality hypothesis a priori” (p. 66). Similarly, the worldview hypothesis that interprets paranormal belief as the product of broad subjectivism, and of a common human approach to ’making sense of the world’, is not very convincing. People who believe in the paranormal don’t necessarily reject objective science (p. 73). Irwin reinterprets the research findings in support of the worldview hypothesis as underlying personality dynamics : a perceived vulnerability to uncontrollable events and a concomitant need for a sense of control. The findings in support of the psychodynamic functions hypothesis are understood the same way : paranormal beliefs, “whether realistic or delusory, can promote psychological well-being by acting as a buffer against the harsh realities of the world” (p. 104). The cognitive deficits hypothesis is widely known. Paranormal believers are commonly depicted as illogical, irrational, credulous, uncritical and foolish. This sceptical derision is often partly designed to discredit parapsychological research as a legitimate scientific entreprise. But some variables such as the influence of the familiar demographic variable of ’highest level of education’ have proved to be rather inconsistent (p. 78-79). This hypothesis appears to be rather more successful as a polemical device for sceptical commentators than as an empirically grounded theory of paranormal belief (p. 90). Irwin suggests, however, that the findings would be more appropriately described by “other cognitive processes potentially less deprecatory of paranormal believers (e.g., creativity and reasoning style)” (p. 90). The book ends with the presentation of an integrative theoretical model that had been already almost completely published (chapter 8, 107-128) : A causal model of belief in scientifically unaccepted phenomena, trying to account for the evident complexities of the development of paranormal beliefs, from early childhood experiences with a diminished control. Throughout this book, one major issue is to distinguish beliefs, attitudes and interpretations of experiences that may occur first and need coping. Indeed, “paranormal belief evidently does have some influence on behaviour and thus is something more than a mere cognitive abstraction” (p. 69). Findings of research as of clinical practice with people living exceptional experiences (Belz, 2008) point that the resort to paranormal is less a symptom than a potential solution to psychological conflicts.